Tag Archive | "Horseface Loach (Acantopsis choirorhynchus)"
The Horseface Loach (Acantopsis choirorhynchus) of Southeast Asia is found in the rivers, streams and backwaters of Singapore Malaysia, Borneo, Burma (Myanmar), Java, Sumatra, Thailand, and Vietnam. The head and nose of the Horseface Loach is elongated and “horse like” in appearance and like many other loaches, it has a thin, elongated body that is well suited for burrowing into sandy substrates. Coloration of these fish varies from gold, tan to silver with many irregular black markings over their bodies. They are peaceful scavengers and well suited for medium to large sized community aquariums. The Horseface Loach from Malaysia is similar to the Longnose Loach (Acantopsis octoactinotos), from which it can be distinguished by it’s down turned (horse like) nose. The Horseface Loach buries itself in the bottom substrate; the Longnose Loach does not. The Horseface Loach is fast moving and much less aggressive than the Longnose Loach which regularly feeds on juvenile fish. The Horseface Loach is a shy, peaceful, primarily nocturnal fish that likes to hide in plant roots, driftwood, rocks and caves during the day. They like to bury themselves when threatened and MUST be provided with a deep base of sand or fine gravel substrate in the aquarium. Water worn rocks, driftwood branches and tree roots should be arranged to form plenty of hiding places and shaded areas for these fish. Because of their burrowing activities, the driftwood in the tank should be planted with Java Fern and Java Moss to provide them shade. Horseface Loaches need a high proportion of dissolved oxygen and moderate moderate water movement. This means the implementation of a good power filter, at least one additional power head and an airstone or two. Like most other loaches that inhabit running streams, the Horseface Loach is intolerant to buildups of organic pollution and needs clean water to thrive. This means regular weekly 30-50% water changes. 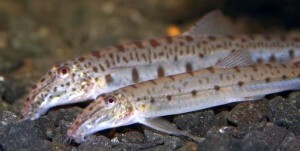 The Horseface Loach has not yet been bred in an aquarium environment. Tropical fish keeping enthusiasts will find that feeding the Horseface Loach is easy. They are largely carnivorous and prefer freeze-dried bloodworms , tubifex , frozen and live foods of all types. They can also be conditioned to accept high quality carnivore flake foods and shrimp pellets. Horseface Loaches are usually 2″ to 3″ long when available for purchase.